Scanned images from original Harper’s Weekly, Robert Schwemmer Maritime Library. NOAA archaeologists have discovered the battered hulls of two 1800s whaling ships nearly 144 years after they and 31 others sank off the Arctic coast of Alaska in one of the planet's most unexplored ocean regions. 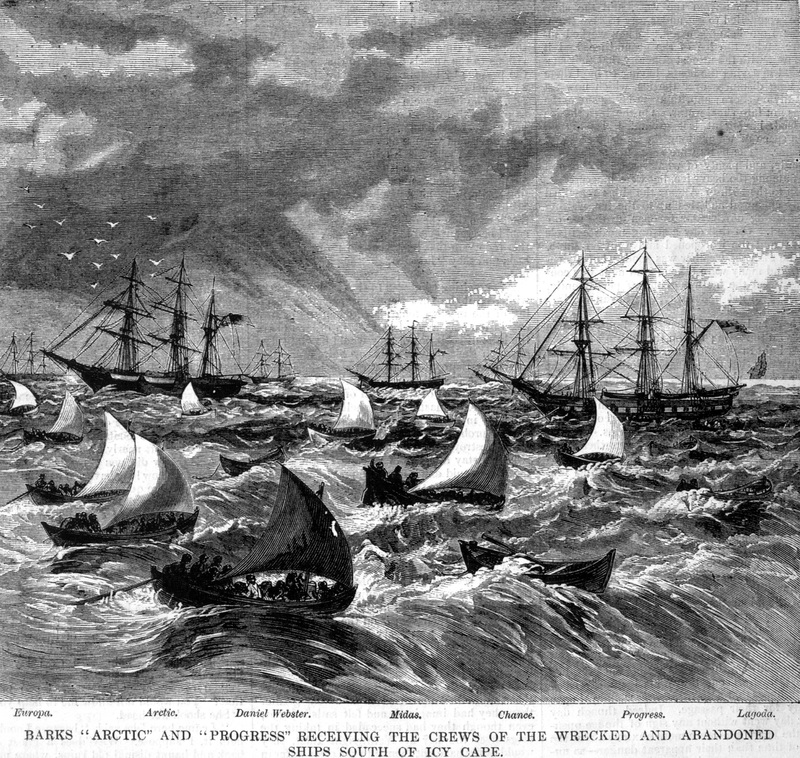 Abandonment of the whalers in the Arctic Ocean, September 1871, including the George, Gayhead, and Concordia. Scanned from the original Harper’s Weekly 1871, courtesy of Robert Schwemmer Maritime Library. 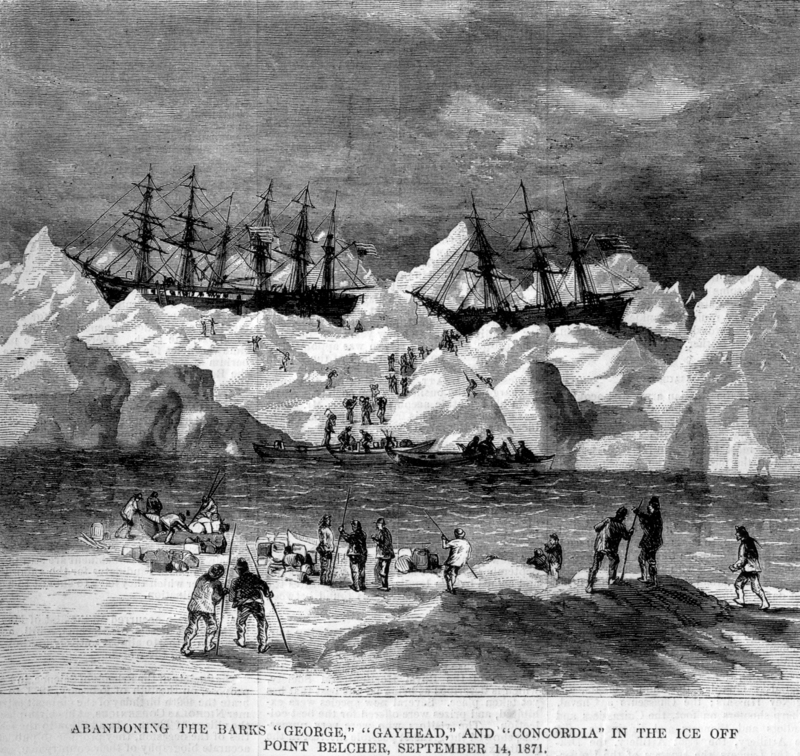 The shipwrecks, and parts of other ships, that were found are most likely the remains of 33 ships trapped by pack ice close to the Alaskan Arctic shore in September 1871. The whaling captains had counted on a wind shift from the east to drive the ice out to sea as it had always done in years past. The ships were destroyed in a matter of weeks, leaving more than 1,200 whalers stranded at the top of the world until they could be rescued by seven ships of the fleet standing by about 80 miles to the south in open water off Icy Cape. No one died in the incident but it is cited as one of the major causes of the demise of commercial whaling in the United States. 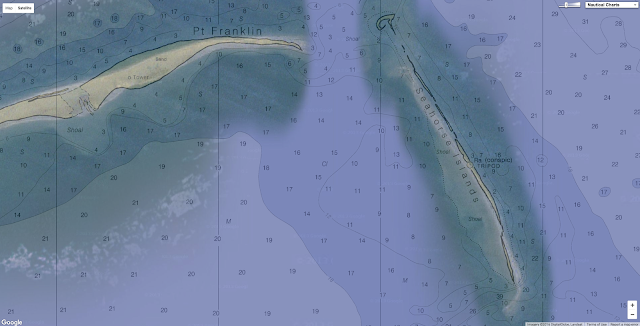 This map shows the area that was surveyed during the Search for the Lost Whaling Fleets expedition. Image courtesy of M. Lawrence/NOAA. With less ice in the Arctic as a result of climate change, archaeologists now have more access to potential shipwreck sites than ever before. 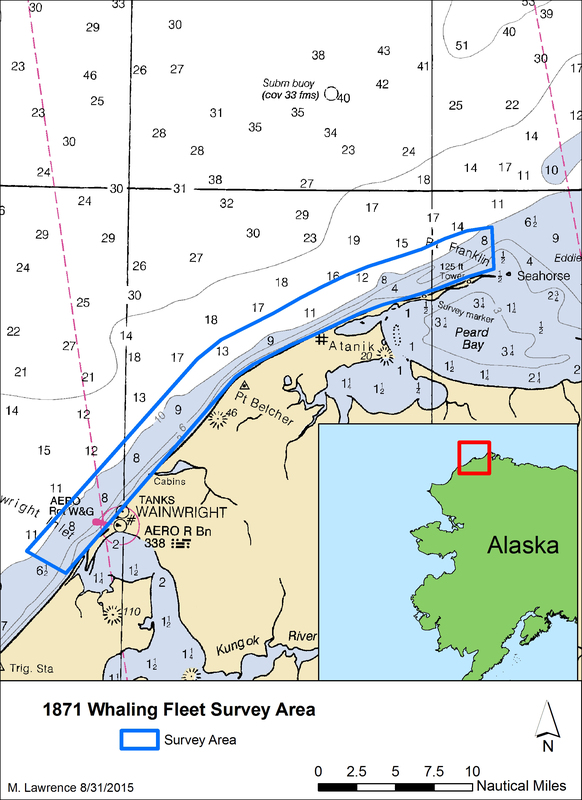 In September, a team of archaeologists from the Maritime Heritage Program in NOAA's Office of National Marine Sanctuaries scoured a 30-mile stretch of coastline in the nearshore waters of the Chukchi Sea, near Wainwright, Alaska. Previous searches for the ships had found traces of gear salvaged from the wrecks by the local Inupiat people, as well as scattered timbers stranded high on the isolated beaches that stretch from Wainwright to Point Franklin. The shipwreck remains located off Point Franklin represent 19th century wooden ship construction. The wood frames are likely from the lower portion of the vessel near the turn of the bilge. The wooden pegs, seen here on a section of ship hull, are known as treenails and were used to fasten pieces of wood together, and in this case they were used to attach the exterior hull planking or interior ceiling planks. Image courtesy of Robert Schwemmer/NOAA . Using state-of-the-art sonar and sensing technology, the NOAA team was able to plot the "magnetic signature" of the two wrecks, including the outline of their flattened hulls. The wreck site also revealed anchors, fasteners, ballast and brick-lined pots used to render whale blubber into oil. "Earlier research by a number of scholars suggested that some of the ships that were crushed and sunk might still be on the seabed," said Brad Barr, NOAA archaeologist and project co-director. "But until now, no one had found definitive proof of any of the lost fleet beneath the water. This exploration provides an opportunity to write the last chapter of this important story of American maritime heritage and also bear witness to some of the impacts of a warming climate on the region's environmental and cultural landscape, including diminishing sea ice and melting permafrost." James Delgado, maritime heritage director for NOAA's Office of National Marine Sanctuaries, said he believes the wrecks were pressed against a submerged sand bar that rests about 100 yards from shore. Working from first-hand accounts of the loss of the fleet, he said the ice opened the hulls to the sea and tore away the upper portions of the ships, scattering their timbers on the beach, while the lower hulls, weighted down with ballast, and in some cases still anchored, stayed in place against the sand bar. "Usually, the Arctic does not destroy ships if there is a natural obstacle like a sand bar, large rocks or a sheltered cove to partially divert the force of tons of ice," Delgado said. Abandonment of the whalers in the Arctic Ocean, September 1871, including the Monticello, Kohoa, Eugenia, Julian, Awashonks Thom Dickason, Minerva, Wm. Rotch, Victoria, and Mary. Wainwright Inlet is in the background. Courtesy of Ted and Ellie Congdon, Huntington Library. On Sept. 12, 1871, the captains of the 33 whaling ships caught in the ice convened aboard the Champion to consider their options for saving the 1,219 officers, crew, and in some cases, families, from their fate. Although, their situation was dire, there was some small glimmer of hope for rescue by seven nearby ships. However, to save such a large party, the rescuing whale ships had to jettison their precious cargoes of whale oil, bone and their expensive whaling gear to make room for the survivors. The rescue ships were able to sail safely out of the Arctic and back to Honolulu, where hundreds of native Hawaiian whalers aboard the stranded vessels lived, while others sailed on to San Francisco, New Bedford and other cities. A still-growing El Niño set to bear down on U.S.
What happened to the Polar Vortex?